Pete and the crew had the best time designing and building the Owl's Nest Library Treehouse for students at the Omni Montessori school in North Carolina! Inspired by the school's connection with nature, Pete designed the platform in accordance with the Fibonacci Spiral. This sequence of numbers, wherein each number after the first two in the sequence is equal to the sum of the two preceding numbers (e.g., 1, 1, 2, 3, 5, 8, etc. ), approaches the golden spiral, which is often found in nature. Leaves, flowers, pinecones, seeds, and shells are just a few of the natural objects that embody the golden spiral. Pete loved the idea of incorporating this naturally-occurring pattern into the treehouse, and made sure that the curve of the platform and the spiraled reading bench inside followed Fibonacci ratios. To top off this nature-loving treehouse, Pete integrated owl features into the facade with two rounded windows and a wooden beak. The resultant treehouse seems as playful and curious as the students within! The crew loved creating a space for kids to read, play, and discover, and wish the students many years of joyful learning! One of Pete's original drawings of the treehouse. Learn more about Pete's design process here! Rolf, a multi-talented member of the NT&S crew, carved the owl's beak out of cedar. The crew built a little lending library on one of the host trees of the treehouse. Students and their families can borrow a book from within the treehouse or from this little library and read outside on the benches, rocking chairs, or porch swing. Interior designer Christina Salway found the swing at a local home supply store, and the rocking chairs at Home Depot. The exterior of this treehouse is clad in cedar shingles. A diverse combination of red and black oaks, sweet gum trees, and elms support the Owl's Nest. The crew also based this bench on the Fibonacci Spiral; the distances between the dark IPE inlay stripes approximately correspond to the number sequence. With its gentle curve and large windows, this nook is a unique, illuminated, and lovely space to curl up with a good book. Christina found the ceiling lights at Kichler Lighting, the floor pillows at Home Goods, most of the throw pillows and blankets at Target, and the owl pillows from Land of Nod. These items bring softness and coziness into the reading nook. Christina notes that the stools surrounding the central table are vintage, and the chair at the desk in the corner is from West Elm. She recommends shopping at a variety of stores (both small and large), and combining old and new pieces that compliment each other to create a cohesive, one-of-a-kind space. The NTS crew used pine tongue and groove for the interior paneling. "The children, that range in ages 3 to 12, are thankful that every day they can escape to a wondrous place that allows them to be in the trees, one with nature, and taken away by their own imaginations as they read a book or just sit among the cozy cushions while they listen to the rustling of the trees. I feel lucky because each day as I peer out of my office window, I receive the perfect gift of watching them enter in amazement, touching the bookshelves that were crafted to specifically represent the variety of trees that make up our 7-acre campus, marvel at the details of the “circle bookcase,” as they call it, use the Fibonacci spiral bench as a learning tool as they measure it to scale, and read a most suiting quote carved on a circular slab of wood mounted on the wall... I also watch our families enjoy the outdoor space that was created as an extension of the library that invites you to sit in a cozy space underneath on the hanging porch swing or on a rocking chair after grabbing a book from the lending library mounted outside the Owl’s Nest. It is magical." Thanks for the kind words, Beth! We are so happy to hear that the students and their families love the Owl's Nest! 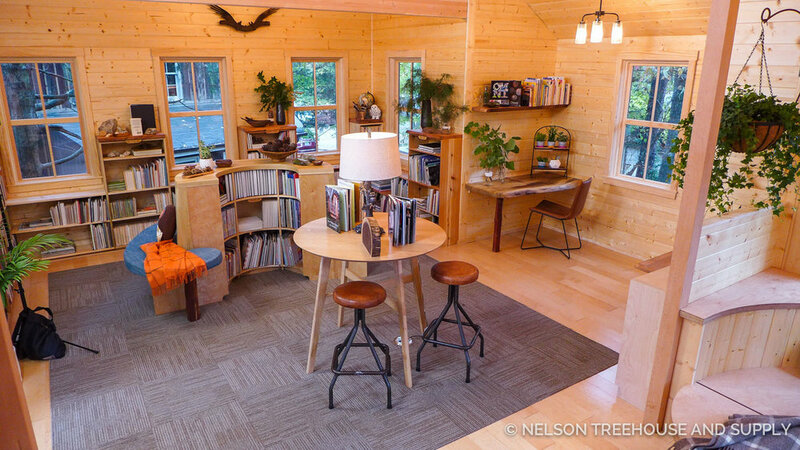 Christina's guiding intention with the interior design of the Owl's Nest was to make it an inclusive, engaging, and interactive learning space that kids would love. 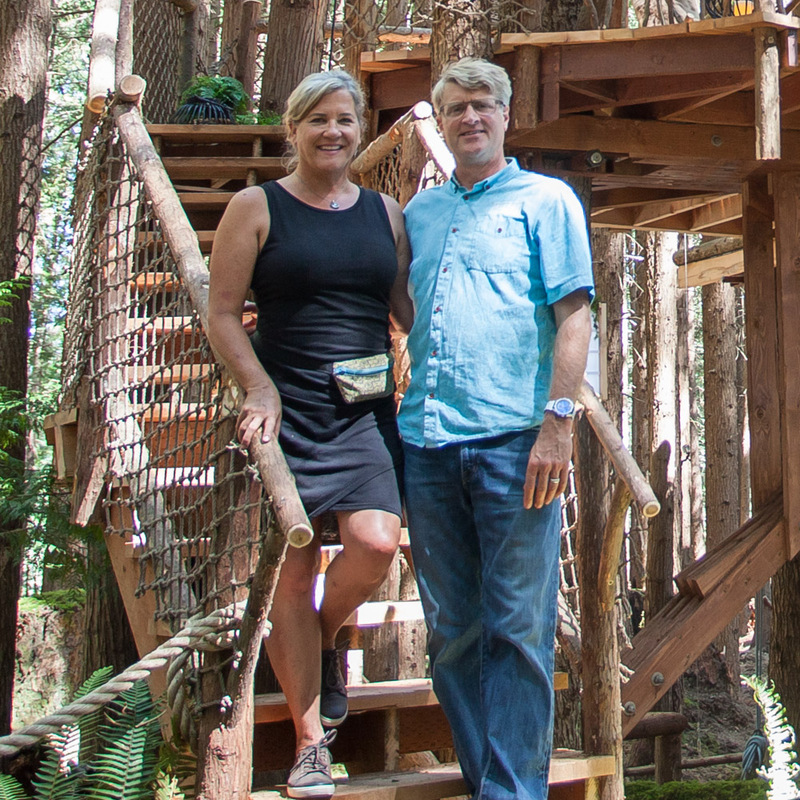 Like Pete, Christina hoped the items inside the treehouse would engage kids on multiple learning levels, from the books to the bookshelves themselves. The bookshelves are made of distinct species of wood to help students learn about trees. The greenery on top of each bookshelf corresponds to the type of tree the shelf is made of; for instance, Christina placed pine branches in a vase above the bookshelf made of pine wood. This helps students learn to identify living tree species and their wood in furniture form. The story behind the mounting hardware for these planters is so special: on one of the build days, Rowan, a teacher from the Omni school, led students and Christina on a treasure hunt around the school's expansive property. Rowan has a personal connection to the property, and enlighten the group on its fascinating, multi-layered history. Students found many old farm artifacts on their tour, including curved parts of farm equipment. Christina took these pieces to a local welder, who added brackets so that they could hold planters. The finished hardware for the planters looks elegant and unique, and holds a very special historical connection to the land. Small, sentimental touches like this give the treehouse a rooted sense of place. The ramp to the treehouse is wheelchair-accessible, and the deck is safely surrounded by trusty NTS hog wire railing. Pete situated the treehouse around an existing outdoor amphitheater on campus. These outdoor benches provide an excellent view of the owl's face! Creating a playful, welcoming, and inspiring learning space for kids was an exceptionally meaningful experience for Pete, the NT&S crew, and Christina. Working with the dedicated staff and faculty of the Omni Montessori school, and meeting many students was such a privilege. Here's to many years of learning and dreaming in the trees! Stay up-to-date with our treehouse tours by following us on social media and subscribing to our mailing list!